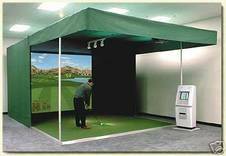 Indoor golf simulators can be extremely complex and in the same time extremely expensive, depending on the degree or realism the player wants to obtain. If you desire the ultimate experience, a lot of high performance devices are going to be used. Let’s have a look at the most important components of an indoor golf simulator. In case you want to install one in your house, you should be aware that the whole system is going to be completely enclosed by a frame and very resistant insulated panels that can come in any size and color. On the floor there is going to be a mat full of sensors and with multiple surfaces that try to imitate all types of grass you can find on most golf courses. Somewhere near you are going to have the central computer that comes with a touch screen display that lets the player modify different settings like the weather or the wind speed. On one side of the enclosed square you are going to have a projection screen where you will see the three dimensional images generated by the computer. Of course, for this you are going to need a high definition projector with a great contrast rate. Different sensors are going to be all around the area for offering the player the best simulation. Besides all these you can find numerous other devices, each having a role in creating a realistic experience.